According to a new research report by Transparency Market Research (TMR), the global electrosurgical devices market demonstrates a highly fragmented structure due to the presence of a large pool of participants. The leading players in this market are concentrating aggressively on developing new products, providing advanced services with multimodality application, and improving coagulation and cutting properties. Currently, the entry barriers are low for new entrants. However, over the forthcoming years, the high level of fragmentation, price competition, and the rise in the research and development costs may limit their growth prospects. The competition within the market is also projected to increase in the years to come, reports the study. TMR estimates the opportunity in the worldwide electrosurgical devices market to rise at a CAGR of 6.70% between 2016 and 2024, increasing from US$4.48 bn in 2015 to US$7.96 bn by the end of the forecast period. Electrosurgical accessories have emerged as the most valued product in this market. Researchers anticipate this segment to maintain its dominance over the next few years. The report considers hospitals, surgical ambulatory units, and specialized clinics as the key end users of electrosurgical devices. The implementation of favorable reimbursement and medical insurance policies in developed as well as developing economies has influenced the uptake of these devices positively among end users across the world. The study further examines the worldwide market for electrosurgical devices on the basis of its presence in various regions, namely, Latin America, the Middle East and Africa, Europe, Asia Pacific, and North America. Among these, North America has surfaced as the most attractive regional market for electrosurgical devices, thanks to the increasing number of surgical procedures, easy availability of new and technologically advanced product varieties, and the rising focus of players on mergers and acquisitions. With the rising prevalence of cancer and the presence of a massive base of the geriatric and obese population suffering from cardiac, orthopedic, and several other chronic problems, this regional market is likely to retain its dominance over the period of the forecast. 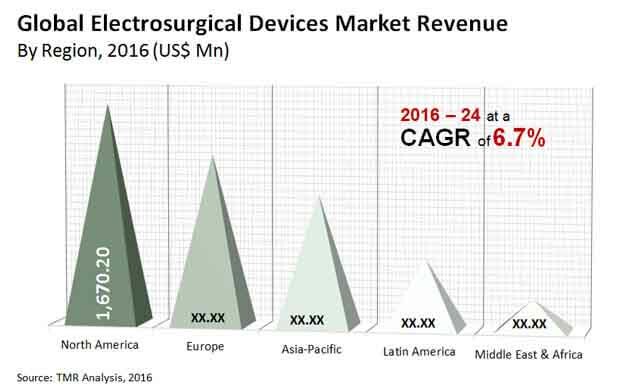 Apart from North America, Asia Pacific is also expected to register a promising growth in its market for electrosurgical devices in the near future, states the research report. “The increasing emphasis on improving the healthcare infrastructure in various developed as well as emerging nations is the main factor behind the substantial growth of the global market for electrosurgical devices,” says a TMR researcher. The funds invested by the government bodies for the research and development of target-specific surgical devices and advanced medical treatments are being increased significantly, reflecting positively on this market. Overall, the future of this market looks thriving; however, the stringent norms and policies by the governments for quality and safety regulation may act as an obstacle in the growth trajectory of this market in the near future, notes the study.